This Disney Cars 3 Craft Kit looks like fun that will keep kids busy for a long time!! Hurry and get the Bendon Cars 3 100-Piece Activity Set Craft Kit today for only $3.16 (Dropped Again! Now only $2.96) from Amazon! Big savings off the regular price of $9.09 (The list price now shows the list price at $12.99). Limit 4. Get FREE shipping (2-day for Amazon Prime members) when you purchase $25 or more of eligible items across any product category. Check out the Disney Cars 3 Craft Kit details below. 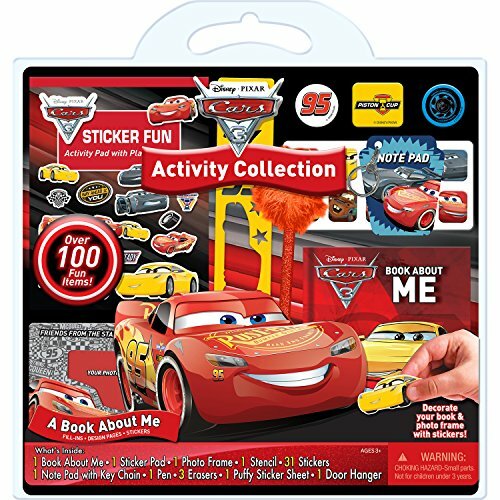 Find a plethora of playful fun in Disney Cars 3 100-Piece Activity Set Craft Kit! Your child will have hours of fun with the many engaging activities including a book about me, sticker pad, photo frame, erasers, and much, much more! It’s a perfect start to any beginning artist’s collection! Buy the Bendon Cars 3 100-Piece Activity Set (AS53725) from Amazon. Previous articleFruit of the Loom Women’s No Show 6 Pack Socks Deal! Next articleMiracle-Gro LiquaFeed Advance Starter Kit + Garden Feeder Only $3!